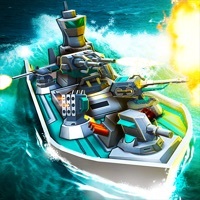 Build the biggest, most blisteringly powerful battleship fleet imaginable, then fight back against the tyrannical Blackwater navy in this hard-hitting action-RPG from the makers of Bloons TD 5. 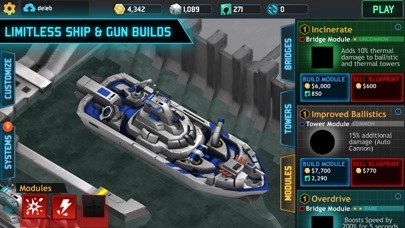 CRAFT YOUR SHIP Choose one of 3 ship classes, fill multiple gun slots with powerful weapons, and add Modules to get new abilities. Take your custom ship build into one of 15 missions, and unleash pure havoc as you target your weapons, ram enemies to bits, and trigger ocean boiling special abilities. 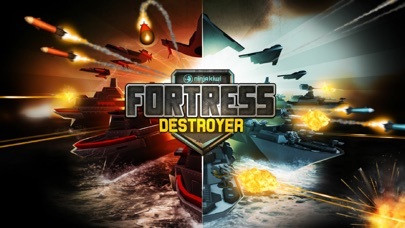 Earn resources and precious Blueprints with each victory, upgrade your ship, and build a fleet of up to 15 ships to wrest command of the seas away from your relentless enemy. 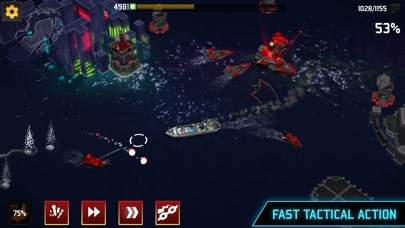 FAST AND FURIOUS Forget about slow ship simulations you've seen before - this is smooth, one-touch driving with the ability to dodge incoming fire, auto-target enemies, and line up nitro boosts for awesome ram combos. CRUSH YOUR ENEMIES Blackwater isn't going down without a fight - you'll face dozens of vicious enemies who can form a variety of deadly attack groups. 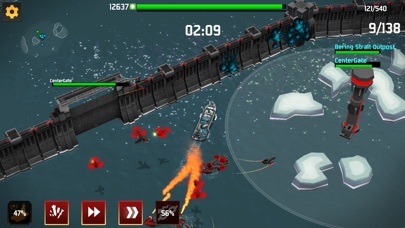 Navigate past enemy turrets and fortifications to crush enemy-spawning factories. Then face off against huge armored boss ships that use every ounce of their firepower and their signature special attacks to send you to a watery grave. BUILD YOUR FLEET 15 different ship types, 16 Bridges, 100+ weapons, and 75+ modules allow you to craft an incredible array of powerful ships. Use Fleet Squadron to call in two of your other ships to tackle tough objectives, or send other ships off on timed missions to come back with critical resources to help you grow even stronger. YOUR MISSION, IN A GRIM NEW WORLD In 2063, vast ice shelves in western Antarctica broke free, crushing coastal cities beneath cataclysmic waves, overwhelming nuclear failsafes, and plunging the world into disease, mutation, economic collapse, and regional conflict. Governments crumbled, and in 2065, Aiden Black, head of the world's largest naval military contractor, Blackwater Enterprises, unleashed his stockpiled fleets and seized control of the seas. You are a captain in the New Coastal Alliance, a coalition of surviving national and private fleets held together by the need to confront Blackwater. You must arm your ship, collect valuable Blueprints to build your strength, and assemble a fleet of warships mighty enough to challenge Blackwater and allow our world to rebuild. 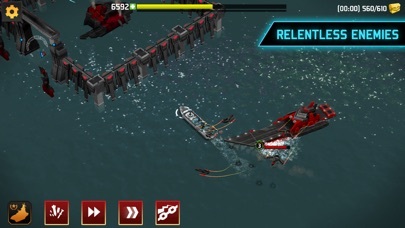 Download and play now, Captain - your fleet awaits! -------------------- Requirements: Requires iOS 8 or later, iPhone 5 and iPod Touch 5 or later, iPad mini 2 or later, and iPad 3 or later. Single player offline play is supported, but for best experience, progress protection, and support, an internet connection is required to register your game data (player is financially responsible for internet, carrier, data, device, and other services). A Note on Stores and In-App Purchases: As a paid game, the economy and Blueprint loot systems are balanced so that you do not need to use any store purchases in order to have fun and be successful. For this reason we have provided the option for you to dismiss the Store entirely - you can play as if the store didn't exist by selecting "Never" for the appearance setting. If, however, you want a chance to get Blueprints or resources faster, you can choose for Salty to visit your headquarters from time to time. We're using this unconventional approach to the Store because we understand different players want different things, so please use the settings that suit you best, and feel free to give us feedback at support@ninjakiwi.com. Salty's Store does contain in-app purchases. Beyond setting the Store to "Never" appear, you can also disable in-app purchases in your device's settings. Fun little game. Begs for more content, though. Really fun game but you have to replay the save 10 levels over and over. Needs a story line with more levels. Good game. Needs updates and more types of boats. Like it because its fun,addicting, and worth it! Don't purchase the In App Purchases. They screw you. I purchased the Bulwark battle cruiser for $6.99 and I'm sitting here looking at ship PIECES. You are given $500,000 in the deal but it costs $750,000 to build the hull and then each bridge costs $250,000 to build. That doesn't include the other included pieces. If I spend real money to buy a battleship I shouldn't have to sit here looking at ship pieces. I'm negative $750,000 and I don't have it so I can't do anything. It's ridiculous. I won't ever purchase anything from Ninja Kiwi ever again. This game, AT FIRST, was beautiful. I loved it and played it for an hour and enjoyed every last second. BUT, we have one tiny issue. IT IS IMPOSSIBLE TO PROGRESS WITH OUT PAYING. ( well not impossible but very difficult ) A.K.A folks, A pay to play game that is pay to win. If this sounds unattractive to you, don't buy it. Unfortunately for me, I hate paying extra money for an app I already paid for. That's my two cents on this app. A little screwed up, since it takes 1-3 missions to get enough parts/materials for making components. LOVE the wide selection of bridges, ships, and turrets. Also a little bit too much sci-fi for warships still on the sea, lol. Also doesn't deserve to cost $2.99, should be $1.99 or less. Hint to all new players, start off as Destroyer. I love the game, the mechanics, the weapons!! 2 tweaks would give this game 5⭐️ from me. (1) I would like to see a few more missions since it takes a little bit of time to gain levels. (2) I also need an option to be able to merge weapons together to get a higher grade of that weapon or higher stats from the merge. Thank u Devs for this great game!! I look forward to your updates.